A great big shout out to Shane and Julia and their team for their great effort in cleaning up the the Bay last weekend… go and check out their website and the pictures they have posted! Awesome mahi and thanks again to all who were a part of that mission…. 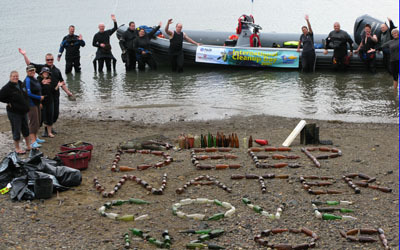 Fifteen volunteers from as far as Auckland removed hundreds of KG’s of marine debris from Deep Water Cove this weekend as part of the Project Aware International Underwater Cleanup Day 2009. Deep Water Cove (Maunganui Bay) located near Cape Brett is well known as a past and present pristine sheltered anchorage in the Bay of Islands, popular dive spot, former Zane Grey big game fishing base, and final resting place of the Former H.M.N.Z.S Canterbury. This beautiful spot is also the resting place of the thousands of empty vessels – of the glass kind.One month ago Northland Dive (aka the Cowshed) located on Russel Rd offered the opportunity to be a part of the underwater cleanup to their regular clients. “It’s great these people were keen to travel from as far as Auckland to help clean up one of their favourite dive spots – spaces filled up fast.” said Northland Dive Co-Owner Shane Housham. It was a flat, sunny day. The volunteers traveled from Te Uenga Bay by Northland Dive’s “Double 0 7”. Beneath the water several octopi, squid, baby conger eels, clown nudibranchs, and eagle rays were found living among the results of years of above water celebrations. Visit the Northland Dive website for the full article. The photo is theirs as well!